What Is DA Form 5121? 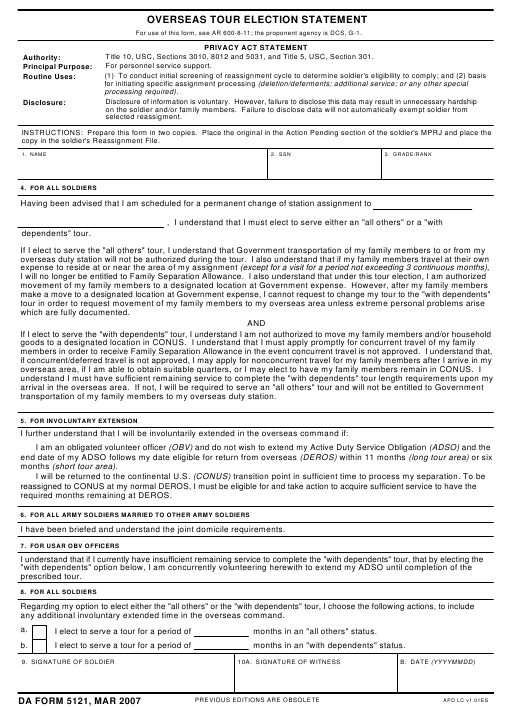 DA Form 5121, Overseas Tour Election Statement is a form used to decide if a soldier is eligible for OCONUS tours and determine election for movement of family members to tours outside of continental U.S. territories. An up-to-date version of the statement - sometimes incorrectly referred to as the DD Form 5121 - was released by the Department of the Army (DA) in March 2007. The newest DA Form 5121 fillable version is available for digital filing and download below or can be found through the APD website. The DA 5121 is a required form for all overseas assignments along with the DA Form 4036, Medical Dental Preparation for Overseas Movement and DA Form 4787, Reassignment Processing. The information provided within the form can be used as the basis for initiating specific assignment processing like additional service, deletion or deferments. How To Fill Out Da Form 5121? For use of this form, see AR 600-8-11; the proponent agency is DCS, G-1. Title 10, USC, Sections 3010, 8012 and 5031, and Title 5, USC, Section 301.
copy in the soldier's Reassignment File. make a move to a designated location at Government expense, I cannot request to change my tour to the "with dependents"
transportation of my family members to my overseas duty station. required months remaining at DEROS. I have been briefed and understand the joint domicile requirements. any additional involuntary extended time in the overseas command. months in an "all others" status. months in an "with dependents" status. Before interviewing a soldier, the Personnel Reassignment Work Center conducts a reassignment briefing. After that, a pre-move (overseas orientation) briefing is scheduled. It is conducted within 30 calendar days of EDAS cycle date. The person authorized to direct the utmost support of all activities included in the reassignment process is the garrison or division commander. The Personnel Reassignment Work Center is responsible for organizing and planning the soldier's leave, travel time, TDY en-route, determining the anticipated date of loss, requesting an HRC deletion via EDAS (if applicable), sending a notification to the installation retention and verifying the medical readiness classification (MRC). The soldier will need to complete the DA Form 5121 during the interviews. This form should be prepared in two copies. The original is placed in the Action Pending section of the soldier's MPRJ and a copy is placed in the soldier's reassignment file. The DA 5121 requires the soldier's personal data - their name, SSN, grade and rank - for identification purposes in Items 1 through 3. Item 4 is mandatory to file under any conditions. It requires specifying the soldiers' reassignment location. Items 5 through 7 are applicable under special conditions and contain information for the soldier to read and accept. Item 8 is for the soldier's duty status and the length of tour in months. The completed form has to be dated and signed by a soldier and certified by a witness.